Can I use a creature's tap ability multiple times in one turn if I can untap it? 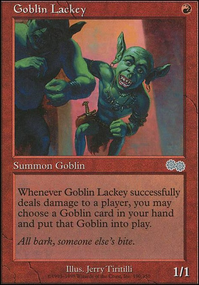 If a Creatures is untapped durring Combat, Can I use that creatures Tap ability multiple times as response to declared attackers. Do I have to pay the equip cost ( Thornbite Staff)? Equipped creature has "(2), Tap: This creature deals 1 damage to target creature or player" and "Whenever a creature is put into a graveyard from play, untap this creature." 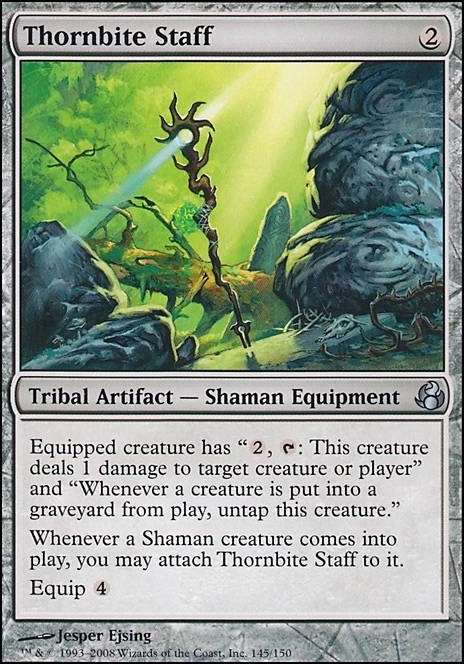 Whenever a Shaman creature enters the battlefield, you may attach Thornbite Staff to it. GhostChieftain on Goblins for all! 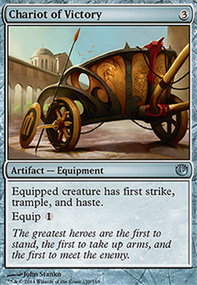 Purphoros, God of the Forge is a gnarly card when paired with krenko. Thornbite Staff is a complicated card and it takes a close reading. No shamans required. The combo I was imagining, was your: Ashnod's Altar + Eldrazi Displacer + Trostani Discordant or variation thereof, with Thornbite Staff on any old creature. The infinite mana and infinite death triggers translate into infinite damage. It has the downside of not going infinite with the infinite mana netted by Peregrine Drake + Deadeye Navigator / Eldrazi Displacer so there's that. 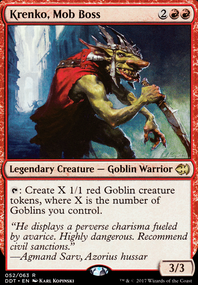 Doesn't go infinite with Roon but it is value in the meantime. Any death trigger, your own or another's turns into a Roon activation if you have the mana for it. Of course you're correct. 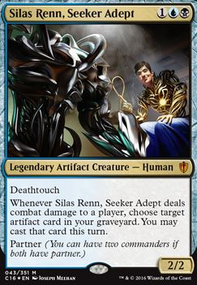 You probably know this already, but I think that along with a creature which produces tokens when it enters -- eg, Grave Titan or Sengir Autocrat -- Whisper can produce a combo. The same is true of Hell's Caretaker . One has Whisper out (or the Caretaker), then plays the Titan, which makes two zombies on entry. She sacrifices the Titan and a zombie, and brings back another creature from the grave (which was already there before she entered play; you need to set up a bit). This untaps her as Thornbite Staff triggers on the sacrifice. 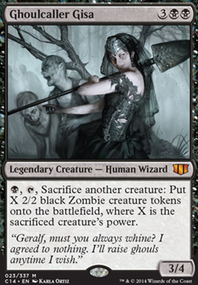 She then sacrifices the second zombie and the creature she resurrected to bring back Grave Titan , who in turn makes two more zombies. This action causes Thornbite Staff to untap her again. This is repeated ad nauseam. 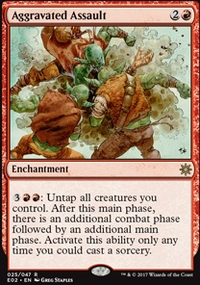 If one has a creature such as Blood Artist or Zulaport Cutthroat on the field, this will kill your opponent gradually with the death triggers. Thanks for the help! I am definitely on board with Diregraf Colossus , it is excellent redundancy for Bridge from Below, which is easily disrupted. The same could be said for Pitiless Plunderer , which is a dupe for Phyrexian Altar when used with a sac outlet. I love the redundancy. We have already discussed Dark Deal and Mindslicer . I have cut DD and am not so in love with Mindslicer that I wouldn’t cut it. The next juicy piece of tech will probably push it out for me. Regarding Midnight Reaper , I’d be hesitant to use it because I am concerned that the damage would add up and eat into our life total for Razaketh. 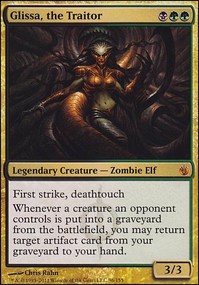 Reaper is a zombie and draws for itself which is nice but I’d probably go with Grim Haruspex first. Liliana, Untouched By Death was a thought experiment and I am pretty comfortable saying the deck is better without it. Unless you REALLY recommend Thornbite Staff to me, I suspect that same could be said of it too. On a bright note, I am 100% on Mausoleum Secrets and think Culling the Weak will be in the same boat. Let me know how your testing goes!